The past and future of the Sun's solar cycle and possible impact on the Earth's climate. We all find comfort with the cyclical and predictable events in nature like sunrise, the seasons and for radio hams the solar cycles. The solar cycle is one of those natural rhythmic cycles that has reliably peaked every eleven year or so. The cycles may vary in intensity and have been as short as nine years to as long sixteen, but they always eventually arrive and that is the truth for anyone giving them attention. What are the affects beyond radio propagation and how reliable are these cycles, what if they stopped or dramatically changed in their intensity or duration, what would it mean? The solar cycles are generally thought of as the cyclical rise and fall in the calculated sunspot number over time. The sunspot number is calculated by multiplying the number of groups of sunspots by ten and then adding this product to the total count of individual spots. The sunspot number is a way of gauging the level of solar activity or solar radiation which has a direct effect on the degree of ionization in the upper atmosphere and ultimately determines the degree of path refraction of high frequency radio waves. Solar radiation, acting on the different compositions of gasses at various heights of the atmosphere, generates layers of ionization and therefore it follows that the number of sunspots can help predict conditions on radio HF bands. The point of highest sunspot activity during this cycle is known as Solar Maximum, and the point of lowest activity is Solar Minimum. The sunspots will appear in pairs in a more or less east-west alignment, the eastern sunspot of the pair will be of one magnetic pole say north and the other western sunspot of the pair will be magnetic south. In the other hemisphere of the Sun the opposite will be true. This situation will reverse from one solar cycle to the next. Also sunspots will be near the solar equator towards the end of a given cycle and towards the poles at the beginning of the next. The detection of the first opposite magnetic polarity sunspots compared to proceeding cycle's sunspot polarity and the observation of high solar latitude sunspots will indicate the beginning of the new cycle, cycle 23 ends cycle 24 begins. A key indicator that the solar maximum has arrived is that the sun's magnetic poles flip from north to south that is the Pole that is magnetic north becomes magnetic south and the Pole that is magnetic south becomes magnetic north. What this means is that a complete solar cycle, when the Sun's poles are back to their original magnetic pole is in fact about 22 years in length. A really neat piece of research gives a view of what the sun has been doing over more than 11,000 years or as far back as the last major ice age event. The Earth is constantly being irradiated by cosmic rays from deep space and these rays produce in the atmosphere a material known as carbon 14 which is absorbed by trees among other things. Trees even dead trees retain a record of the levels of carbon 14 being produced over a very long period of time. Charged particles from the Sun which are greater during periods of high sunspot activity repel the cosmic rays and therefore the more sunspot activity there is the less carbon 14 is recorded in the tree rings. Using the carbon 14 level records the sunspot number estimates have been pushed back as far as 11,400 years into the past and reveal that the current high level of solar activity has not occurred for well over 8,000 years. See figure 1. The solar activity during the last 80 to 100 years is by far the exception. A 2003 study found that there had been more sunspots since the 1940s than in the previous 1150 years. The fact that this period of high activity coincided with the invention and development of radio is not lost on me! Who knows how a world craving communication may have develop if the twentieth century was one of the dead periods of solar activity. Figure 1: The data for the 11,400 Year Sunspot Number has been graphed using an Excel spread sheet. 11,000 Year Sunspot Number data can be found courtesy of the NOAA Paleoclimatology Program and World Data Center for Paleoclimatology, Boulder . A period known as the Maunder Minimum from about 1650 to 1715 suddenly saw very few reports of sunspots. The Maunder Minimum coincided with the coldest part of the period known as the Little Ice Age. While there appears to be a connection there is generally no agreed mechanism that would have low sunspot numbers connected with the Earth's climate in such a dramatic way. It may have at least been contributing factor, but how much of factor is not clear. The effect of sunspot activity in relation to climate change is a very controversial issued at the moment with a complete spectrum of views being voiced. Generally from what I have read and heard it's for the most part regarded as minor factor. Nobody can deny climate change, as the only constant when it comes to the Earth's climate is change. The relationship between sunspots and the Earth's climate is far from understood, which means to me that we can not be certain if sunspot activity has a minor or more significant role on our climate. See figure 2 & 3. The Dalton Minimum was also period of low solar activity, lasting from about 1790 to 1820. Like the Maunder Minimum it coincided with a period of lower than average global temperatures. The cooler temperatures were exasperated by the eruption in 1815 of Mount Tambora on the island of Sumbawa , in what is now Indonesia . This made the winter of 1816 one of the most miserable and deadly on recorded. The volcanic eruption clearly made things worse, but the cold spell was well underway from about 1810. The year 1816 was referred to in American New England as "eighteen hundred and froze to death". Much earlier the Sporer minimum of 1400-1510 was also known as a "little ice age" and saw very few Sunspots. The world experienced an increase in famines, the Baltic Sea froze solid in the winter of 1422-1423 and colonies in Greenland were starved into oblivion. An interesting comparison is between the above Yearly Average Sunspot Numbers and the below Yearly Average Mean Temperature for central England of a similar period of time. Apart from the two obvious correlations it is difficult to see many other links due to the general background temperature noise of other influences, but it is there or is it my imagination! These monthly temperatures are representative of a roughly triangular area of the United Kingdom enclosed by Lancashire, London and Bristol . The monthly series, which begins in 1659, is the longest available instrumental record of temperature in the world. On a cheery note, I was born in July 1957 during possibly the largest solar-maximum for 11,000 years. I was trying to work up an angle on this one, but the best I can do is this. I'm a baby boomer and according to an entry in Wikipedia the baby boom also peaked around 1957. Solar flares and the related Coronal Mass Ejections (CME) are the violent explosions on the Sun's surface as a result of a release of stored magnetic energy in areas near sunspots. These solar flares often affect the Earth's ionosphere and disrupt HF radio communications and produce higher noise levels on the VHF bands. Solar flare effects vary greatly in magnitude primarily due to the intensity of the explosion and if it is aimed at or away from the Earth. Solar flares are far more common during the Sun's solar maximum, but can occur at any time and often with out warning. Variations in the solar wind and shockwaves caused by solar flares buffet the Earths natural magnetic field or magnetosphere causing the shifting magnetic lines of force to induce electric currents into long conductors like power transmission lines and even pipelines. In 1998 a large flare induced magnetic storm totally shut down the electricity grid supplying Canada 's Quebec province. The magnetic storm tripped five 735kV lines causing a loss of some 9450MW of power to the 21350MW load at the time. The system was not able adapt to the sudden loss of so much power and collapsed in very short order. Currents induced in the long transmission lines and transformer core saturation which distorted voltages caused system protection to operate and disconnect the affected vital equipment. The strongest flare recorded was in 1859 and witnessed by British astronomer Richard Carrington whom reported two patches of intensely bright white light coming from the sun. The telegraph which was the high technology of the day crashed, with reports in the United States and Europe , of the voltages induced into the long telegraph wires knocking operators unconscious and igniting fires due to the magnetic disturbance. To gain a perspective on these events a moderate magnetic storm can be about -100nT (nano-Teslas), an extreme storm would be about -300nT, the storm that blacked out Quebec measured -589nT and the 1859 storm has been estimated to have been -1760nT. The implication of an 1859 type storm on today modern wired world would probably be dramatic. An obvious question is how big could a solar flare be? On this I have not found any real material, however some other stars and stars similar in size and age to our Sun produce extremely violent flares very frequently, sometimes as often as every hundred years. A particularly violent flare seen on a star slightly less massive than the Sun in twin star system known as II Pegasi was about one hundred million times more intense than a typical local solar flare. Had this flare occurred on the Sun we would not be here to tell the tale, along with most other life on Earth. We are lucky that the Sun seems for the moment at least to be a much gentler star. Solar cycle 24 which we are all looking forward too is likely to be a significant solar maximum and perhaps if we are lucky it may be the second larges in modern times. The Sun has circulating currents of hot plasma much like the ocean currents on Earth and according David Hathaway of the Solar Physics Group, NASA, the speed of the circulating current known as the Conveyor Belt determines the intensity of future solar maximum. The speed of the conveyor belt will determine the intensity of not the next solar maximum, but the one after. The speed of the conveyor belt is measured by observing the speed at which sunspots move on the surface of the Sun. The conveyor belt moves across the surface of the Sun sweeping sunspots along with it and then plunges deep in to the interior to pick up more energy and returns to the surface, a process that takes from about 30 years to 50 years. See figure 4. Figure 4: Diagram of the Sun's circulating currents of hot plasma. The conveyor belt was moving fast from about 1986 to 1996 meaning lots of magnetic fields will be swept up for the 2010-2012 solar maximum. This is the basis of Hathaway's prediction for solar cycle 24. In recent years however the conveyor belt has slowed to a speed not seen before. 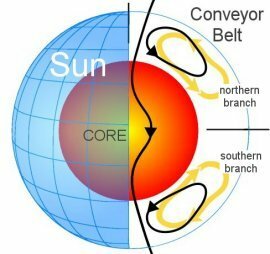 The conveyor belt normally moves at about 1 metre per second and that's how it has been since the late 19th century, but the conveyor belt has decelerated to 0.75 metre per second in the north hemisphere of the Sun and to only 0.35 metre per second in the south. The slow down currently being observed mean that Solar Cycle 25 due to peak around 2022 to 2025 is likely be one the weakest in centuries. It is interesting to note Solar Cycle 25 could be similar to maximums recorded during the Dalton Minimum of 1790 to 1820. There is also speculation that the slow start to Solar Cycle 24 is an indicator of it also turning out to be very weak. Is the Sun about to go quiet again! Better not get rid of those woolly jumpers. See http://science.nasa.gov/ for solar prediction stories among many other topics. Many stories are available as audio files. The sun sustains all life on Earth and provides all our power even fossil fueled power. It is not static, like us it has a beginning and an end and during its life it will change and evolve. On Earth we have no choice, but to enjoy what we get from the Sun and learn to adapt to its changes which are for the most part very gradual, but as research has discovered not always. Happy DXing!